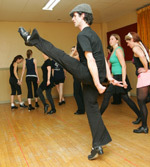 Irish dancing workshops with Irish Dance Star and Lead Dancer of Lord of The Dance, Don McCarron and Newfoundland's own Shawn Silver October 1st-5th 2007 in St. John’s. At the very eastern edge of the North American continent, just north east of Maine, sitting on edge of the grand banks is St. John's, the oldest city in North America. At just under 500,000 sq km the island of Newfoundland Canada is more than 3 times the maritime provinces, New Brunswick, Price Edward Island and Nova Scotia. If it were one of the United States, it would rank fourth in size behind Alaska, Texas and California.Situated between a warm gulf stream to the south and the Labrador current to the north, we live in what is known as "iceberg alley". From spring months to late summer, the beauty of our land and sea scape is unsurpassed. It's not uncommon to see a 300 million ton piece of ice float past your back door, and with these colossal natural wonders come the whales; the minke, the humpback and the potheads. It is surreal actually We are considered North America's best kept secret. Prior to 1932 Newfoundland was an independent country. We had a Prime Minister, our own railway system even our own currency. In 1949, Newfoundland voted by referendum to join Canada. We hold the distinction of being the only democracy to willingly give up our own independence. People have been living here for millennia, and St. John's,the capital city, was established in 1497 coinciding with the landing of Giovanni Caboto.While Viking Lief Erikkson is credited as the first European settler,Newfoundland was home to the Beothuk Indians long before European settlement, and attracted the interest of many diverse cultural interests, including Basque, Portuguese, Scottish, French, English and Irish. All of these groups left an indelible print on the cultural and ethnic influences that make up Newfoundland and Labrador, but none more than the Irish. We are undoubtedly one of the strongest Celtic cultures outside Ireland itself. ."Newfoundlanders are more Irish than the Irish themselves" said Taoiseach Bertie Ahern, on his recent trip declaring Tilting Nl, an Irish Heritage site.While fishing was predominantly Newfoundland's main economic driver, today things have changed. Tourism, oil and gas, aquaculture, technology and music, dance, film, video and television all rule now! These people are the best in the world at what they do, we are very fortunate.This is a real coup for our dance community and for our province. 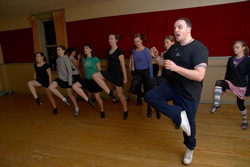 We have a very dedicated skilled pool of Irish dancers here now and with the help of individuals like Michael Donnellan, whose most recent series of dance classes have changed the face of our dance community forever. It's not a chore to come to St. John's for these young dancers, either. St. John's is a very vibrant and young city (despite its age) with a very healthy and robust night life and all the attractions anyone would want. It's alot like Dublin that way. A very European flavor with the friendliest people in the world. It's peaceful, beautiful, full of beautiful art and , brimming with a skilled dedicated group Irish dancers who can raise the roof at the blink of an eye. As a result of our work we've created a solid profile in our province and in Atlantic Canada. I think we've raised the bar for traditional dancers and the dance community in general. The dance company boasts a performing group who are featured as regular guests on many local television programs in Canada and in the province. Some of the groups notable career highlights include 2002 Juno Awards, Choreography and performances with Canada's The Fables, choreography and performance for Cape Breton's Mary Jane Lamond and we have been featured guests on Canada AM's cross country road show. Tourists, visitors and locals alike can catch Shawn Silver Irish Dancers any weekend from May to September at one of the city's Irish Pubs where I host regular weekly ceili's. Family's and friends alike. Tourists are coming here for our obvious topographical beauty and physical attractions, but they are also coming to experience our cultural attractions. 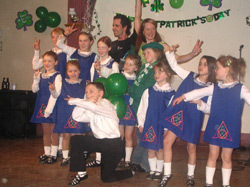 Irish dancing and Irish culture is at the TOP of the list. 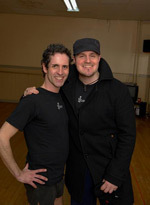 Irish Dancing Summer Workshops with two time world champion and Irish dance star Michael Donnellan and Shawn Silver.. Make your plans now to attend Irish dance workshops in St. John's August 6th-10th 2007. These workshops will be offered to the international world of Irish dancers and classes are already starting to fill up...my advice is book early. We can't wait to meet you! Get in touch with your inner Celt!